………..A place to get inspired………….. Sometimes I just get into a lazy phase where I cannot be bothered to do anything……….hence the silence on the blog. Its like I am in this fog where I have all the words and devices required to express it but cannot get myself to do it. I still carry on with the daily routine but anything that requires me to write, call or email someone – sometimes even important calls – I cannot be interested enough to do it….. I keep thinking and thinking about what I need to do and thats all I do…….. So today being a better day than most days, I decided to put up a recipe that I experimented with on the weekend. S wants meat and fried rice/biriyani on the weekends. I am fed up of eating the same thing all the time – the only exception being dhal which I can eat for days on end – and the only dhal I will eat that way is made by me. That recipe should go down in the hall of fame of recipes for no matter who and how many eat it, they cannot stop raving about it for it is that tasty. But coming back to this post, I was at the library the other day. Usually I pick up a bunch of fiction novels and get back but that day I felt like checking out some of the cookbooks at the library. So after enquiring at the information counter and being told that they have a huge collection of books – I started checking them out. I was on the lookout for some Asian cookbooks considering my penchant for the food…….but did not find them very interesting. A flashback is that while shifting to C from A, I had to literally hand a couple of cookbooks to strangers at the airport as there was no space for me to store them in my luggage. One was an Asian cookbook with pictures for all the recipes and the other an amazing curry cookbook by Madhur Jaffery. All I can hope is that someone is really enjoying having those books! If not, I would’nt mind getting them back!!!!!!!!! Anyways, while browsing through the different cookbooks available, I happened to chance upon Rick Bayliss (I might have the name wrong!) Mexican Everyday book. Pictures looked interesting and so I got it home. Shift to Saturday Night – S is playing virtual cricket and I am bored out of my mind so decided to start browsing the cookbook. And chanced upon a few interesting recipes. One of them was a simple Mexican Garlic Fried Rice. S was not in the mood to have plain rice and wanted a simple fried rice and this seemed to fit the bill. And after tweaking the recipe a bit and making it , I realised that it really was a very simple but tasty rice…..I am definitely going to make it again! Let it come to a boil. Then close the lid to trap the steam in – I use aluminium foil to cover the vents in the lid, reduce the heat to medium low and cook till the rice is completely cooked. Garnish with coriander and serve! Note:You can use any stock – Chicken or veg or Beef. I used Chicken stock which I had at home. I also used a mix of stock and water – so the taste was not too chickenish but gave a mild flavour to the rice which complimented the baked chicken I served it with. The rice appears slightly yellow because of the turmeric I use to preserve the ginger garlic paste I make in advance and store in the refrigerator. I was in India recently for a long due vacation. And since this being the first visit home after our wedding, I got to stay most of the time at my inlaws. And was’nt it an eye-opener? There were so many traditions and words that were new to me. Fascinating to learn of course! I also visited a few places of which I had never heard of before! One of the specialities of Hyderabad is the various biriyanis you get! Each of them taste different based on the spices that go in them but they usually get cooked by something called as the dum method. So this mixture of raw meat and spices and rice gets cooked in steam. It is unlike anything you would have ever tasted before! 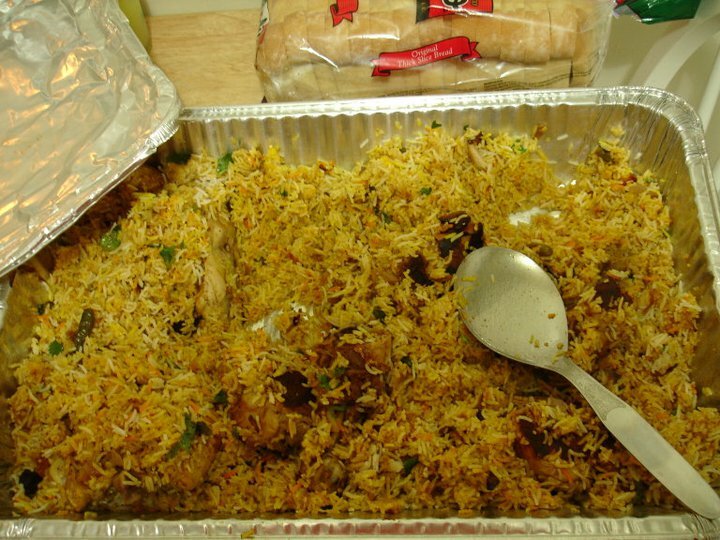 And the best part – I got to eat the biriyani cooked by my mom in law. And man, what can I say? If she was a man and I was unmarried, I would have asked her to marry me right then and there! It was unbelievably tasty!!!!!!!!!! In all my travels through Aus, India and now Canada and US, I always try to taste the biriyani at the local restaurants or even made by me. And I make a mean biriyani myself! But the biriyani she made was just awesome! 2 kg Chicken – In India, you get the whole chicken cut. But here you can use thigh pieces or drumsticks. Breast is usually not recommended for this dish. 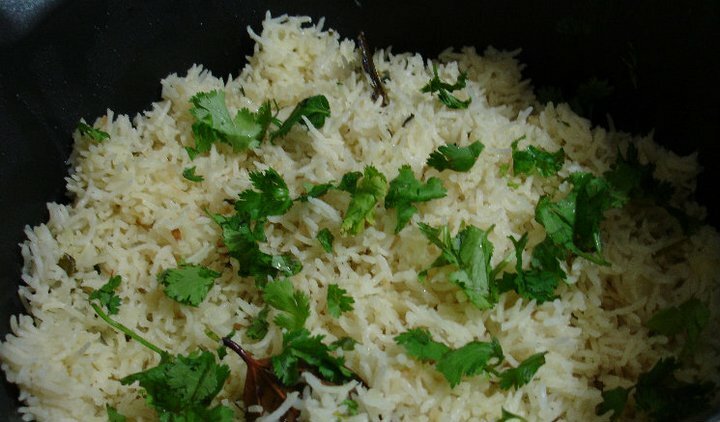 2.5 kgs Basmati rice – Any other rice will not make the dish taste good at all! Water to boil – should be double the quantity of rice. More if required. 5-6 tbsp oil +ghee mixture for frying the onions – More if you want to! Wash the chicken thoroughly and squeeze all the water out. Marinate the chicken with all the above spices, mint, coriander, chillies and yoghurt. Use only half of the garam masala and fried onions. You will need the rest for later. I have found that the wetter the marinade is, the better for the flavour and also more gravy to mix the rice with. So I add a bit more yoghurt and adjust the spices accordingly. Keep it aside. Note: The amount of spices will seem a lot to you but as this flavours the rice too, you do need to add it. Again, go easy on the chilli powder if you cannot handle the heat. Or you can start adding the spices bit by bit and stop when it is 2 levels higher than what you will normally have. This way you will end up with a dish exactly how you want. And because everything keeps well for a few days, you can save it in the fridge for the next time! Now we need to cook the rice until it is half done. For this, take a cooking pan and boil water in it. The water should be double the amount of the rice. If you think you need more, go ahead and add it. Add the rest of the garam masala, salt to taste and the bay leaves. Once the water starts to boil, add the just washed rice to it (Do not wash the rice in advance and keep it aside). Add a few drops of oil so that when the rice starts to cook, the flakes do not stick to each other. Stir the rice and water together and let it cook. Keep an eye because it is critical to have the rice half-cooked. Once it is, immediately drain the rice and keep aside. If you have a sieve, drain the rice using it, immediately pour some cold water to ensure that the rice does not cook further. Now take a wide deep vessel with a close fitting lid. Layer the marinated chicken at the bottom. Pour 3/4th of the oil mixture used for frying the onions on top of the chicken. Layer the half cooked rice on top of the chicken. Pour the remaning oil on top of the rice. Then add the ghee too. Now pour the soaked saffron colour on top of the rice in swirls all over. Cover the lid with a thick cloth – no cheese cloth here for you need to trap the steam in the cloth helping the meat and rice cook. Now keep the clothed lid on top of the vessel. Make sure that no steam leaks by putting a heavy dish or pan on top of the lid to hold it down. 1. Keep the vessel on the stove and cook on medium heat for 5 minutes. Reduce heat slightly and cook for 5 minutes. Again increase the heat to medium again and cook for next 5 minutes. Reduce the heat to low and cook for 5 minutes. By this time, you should start seeing steam trying to escape from the sides of the lid. You can smell the biriyani already but just a little patience – dearies….. Cook for another 5 minutes on low heat. Then open the lid and check if the chicken is cooked through. If not, cook for another 5 minutes on low heat. Check if Chicken is cooked. If not, repeat the steps till chicken is cooked through. 2. I keep the vessel on a flat cooking pan and then cook it using the same procedure detailed above. This prevents the chicken from getting burnt at the bottom of the vessel. Once the biriyani is ready, let it cool for 10 minutes and shift it to a wide baking tray – easier to mix the rice and chicken together giving an evenly coloured rice. Garnish with coriander and the remaining fried onions. Now all you need to do is enjoy! And what makes it taste even better is my onion raita!MMM……………. Writing this has made me want to eat biriyani again!!!!! !